The India-Russia joint venture BRAHMOS missiles system has been readily acknowledged by our Armed Forces as a potent and efficient weapon. It can even find international markets, says a confident BRAHMOS Chief Executive Officer. The future of the BRAHMOS supersonic cruise missile - a successful joint venture between India and Russia - is assured. This was the gist of my conversation with the new BRAHMOS Chief Executive Officer, Sudhir Kumar Mishra, who spoke passionately about BRAHMOS-M (Mini) and the hypersonic BRAHMOS. What made his revelations distinctive were the unusual candidness - a rarity in the scientific community - and the clear vision of the roadmap ahead. "While plenty of work has been done on BRAHMOS-M and we are in touch with the user (Indian Navy and Indian Air Force), the project is on the drawing board awaiting Government clearance," Mr Mishra said. The hypersonic BRAHMOS, he reflected, "is on the drawing and mind board." BRAHMOS is India's only indigenous weapon system which has been accepted willingly by the three defence services, and has stuck to the time-line. BRAHMOS was an accidental venture as a consequence of the sudden demise of the Soviet Union in 1990, followed by the 1991 Gulf War which catapulted the Tomahawk cruise missile to an iconic status. On the one hand, Russia, as the Soviet inheritor state, was hard-pressed for cash and on the verge of closing down its flight-tested cruise missile programme. On the other hand, the Defence Research and Development Programme, having gained capabilities from the indigenous 1982 Integrated Guided Missile Programme, and struck by the Tomahawk success, was eager to start work on cruise missiles. The breakthrough for both came with the setting-up of the BrahMos Aerospace on 12 February 1998 located in New Delhi. In a novel concept, BrahMos became a Government-owned private company with equal partnership and operational control with a share of 50.5 per cent for the DRDO and 49.5 per cent for the Russian NPO Mashinostroeyenia Company. The propulsion system (engine) and airframe came from Russia, while the guidance and onboard electronic module came from the DRDO's guided missile programme. Originally meant to be an anti-ship missile, BRAHMOS is today a successful land-attack-cruise-missile, and a step away from the air version. How far a cruise missile will go depends on its engine; the simpler turbojet which travels short distances or the complex turbofan which can carry payloads up to thousands of kilometres. BRAHMOS is one of its kind which uses a combination of booster and liquid-fueled ramjet engine which gives its super-sonic speed (more than the speed of sound described as Mach One). This leads to its other advantage. With more speed than other cruise missiles, BRAHMOS reduces the target into smithereens with its high kinetic energy impact. BRAHMOS can carry 300 kilograms payload at 290 kilometres (under 300 kilometres as per The Missile Technology Control Regime limit) with a speed of 2.8 Mach. At present, BRAHMOS is mounted on a number of surface ships comprising of Rajput class destroyers, Talwar class frigates and recently on the 15A class destroyers of the Indian Navy. Also in the pipeline are the new ships under construction of project 17 & 17A. Being big, BRAHMOS cannot be fitted in the torpedo tubes of submarines. Regarding the Army, two regiments with four launchers each have been raised with BRAHMOS Block-II LACM, while the third regiment with Block-III missiles is being delivered. This will be followed by another two regiments with Block-III capability. For guidance throughout the flight, BRAHMOS uses a combination of G3, namely, US' GPS, India's Gagan and Russian Glonass systems for accuracy. It has a radar seeker which scans the area in front to find the target and then homes-in with Radio Frequency mono-pulse capability. Block-II version, developed for the Army, has an improved seeker with target discrimination capability, and Block-III version has steep-dive capability to hit vertically those targets hidden behind mountains. With such accomplishments, what is in the pipeline and into the future? "We will carry out flight-testing with full combat configuration on Su-30MKI aircraft in March 2015 to validate the BRAHMOS air version," says Mr Mishra. Giving details, he said that BRAHMOS had initially approached the Sukhoi design bureau for integration of BRAHMOS onto the Su-30 belly. As they asked for astronomical amount, we considered Hindustan Aeronautics Limited, which at that time had no experience with this kind of work. Since then, a lot has been done by HAL in close cooperation with CEMALAC, DRDO labs, like Defence Avionics Research Establishment Centre for Air Borne Systems and Council of Scientific and Industrial Research lab National Aerospace Laboratories. Listing two milestones, Mr Mishra said, "Ground vibration tests on the aircraft with fully loaded weapons configuration have been done successfully by HAL, Nasik. Then, the separation test, which is meant to ascertain the behaviour of the aircraft in terms of its mechanical, electrical and aerodynamics systems after it has released the 2.9 ton BRAHMOS missile has undergone successful wind tunnel test at NAL." Once the final flight test is done, two Su-30 aircraft will be flight tested by Aircraft & Systems Testing Establishment, Bangalore (user) as the precursor to several dozens of aircraft being armed with the BRAHMOS missile. He added, "We have to remember that the present BRAHMOS is the nineties technology which will get dated in 10 to 15 years." So enter, BRAHMOS-M. "BRAHMOS-M will be a new design. A compact engine with better energy propellant which will not compromise on 300 kilometre range; lighter weight with less diametre; speed of 3.3 Mach; and better packaging and routing of pipes with computer aided design and latest electronics." To ascertain the feasibility of BRAHMOS-M, three steps have been initiated. One, HAL has done some preliminary studies. 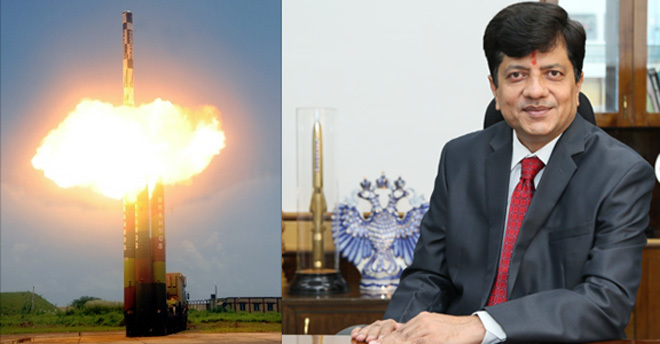 Two, DRDO has conducted design studies which will be shared with Russian NPOM partner. And three, Russia is willing to develop the new propulsion system keeping BRAHMOS aerospace in the loop. This is not all. "The seeker for BRAHMOS-M will have sufficient redundancies to include anti-radiation, Radio Frequency and Imaging Infra-Red capabilities. The guidance in addition to the present G3 combination will also come from indigenous satellite navigation constellation â€” Indian Regional Navigation Satellite System â€” which will have a total of seven satellites of which three have been placed in space." The BRAHMOS-M with a weight of 1.4 tonne for the Air Force version and 1.6 tonne for the navy version will be a breakthrough. "We expect five BRAHMOS-M to be carried by Su-30 (two each on the wings and one on the belly), and two each missile with the Mig-29K and the fifth generation fighter aircraft being co-developed with Russia." Moreover, in addition to the steep-dive capability with Block-III LACM, there will be Block-IV LACM with a â€œsurround capability, to hit hidden targets laterally from the side of mountains." BrahMos's own research team at Hyderabad is already working on Block-IV LACM. Thus, "BRAHMOS-M is ready to be moved from the drawing board to real work once the Government gives the green light." To stay ahead into this century, BRAHMOS envisages a hypersonic engine to replace the present supersonic. "It is envisaged to provide speed of Mach 5. It will follow different aerodynamic laws; and have different propulsion, materials, electronics, data links and suppliers," says Mr Mishra adding that, "We (BrahMos and DRDO) are already working on the engine and hope to test it in five years." What about exports, was the parting question. Mr Mishra replied with confidence that "India and Russia as equal partners have cleared six to seven friendly countries for BRAHMOS exports. It is up to the Modi Government to take the call; BrahMos Aerospace is ready to deliver."